Shake, explore and sing with the Crinkle & Roar Lion by VTech. Press the colorful shape buttons on the lion's side to learn shapes, colors and letters. 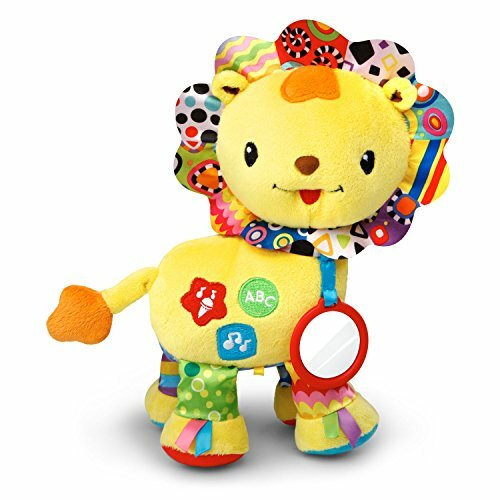 Shake the adorable lion to activate the motion sensor and hear him roar and play other cheerful sounds. Your little one will love the crinkly feet, ribbon tags and textured rings. The lion also includes a baby-safe mirror to build self awareness. It's also the perfect take-along toy and can be attached to carriers, strollers and more. Explore and learn with the playful Crinkle & Roar Lion! Durable Product.